As you know, I had a difficult breastfeeding experience, and decided to wean onto formula at 6 months old. Feeling equal parts guilt and relief, I decided if I couldn’t be the pinnacle of good parenting by breastfeeding as long as my baby wanted, then I would do the next best thing, and be the pinnacle of good parenting by removing the bottle as soon as possible. Once she reached one year old, I would just remove the bottle and start using sippy cups or the like. Being an instinctive attachment-parenting-style mum who formula feeds can be a tricky road to follow. All the natural parenting pages and communities and articles tend to push breastfeeding heavily. I understand the need to promote and support breastfeeding. However, I am sad that this is sometimes done, not in a spirit of positive celebration, but rather in a way that denigrates and demeans women who (by choice or circumstance) nourish their babies with formula. It leaves you with a pervading sense that the bottle is bad, mmmkay! And so I guess I just had this sense that I should get her off the bottle as soon as possible. It’s a bottle. It’s not the devil. 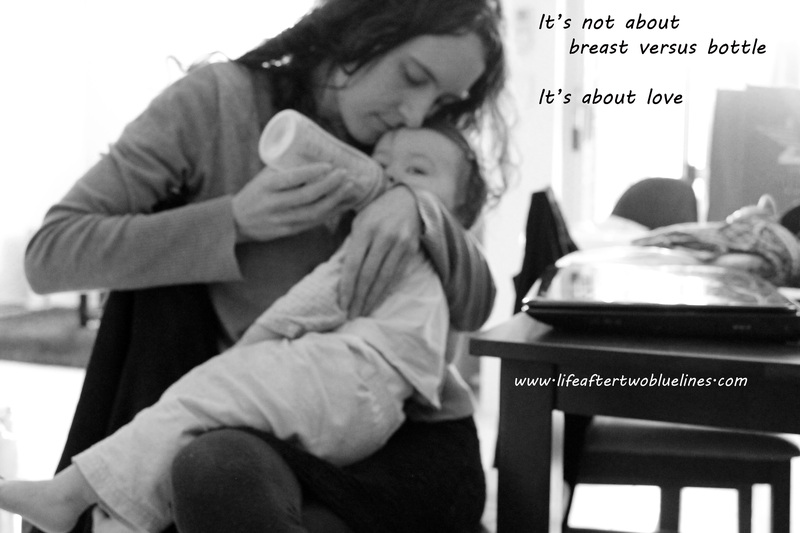 I have always bottle fed the way I breastfed – with her tucked into my chest, the bottle at breast height. As she gets older, her bottle feeds are becoming few and short – just as I see happening with friends’ babies who breastfeed. A few short sips and then they want to dash off and find something shiny to play with again. The other day I was having a quick little feeding session with her, her head snuggled into my elbow, her eyes looking up at me as she drank, and I had a sudden epiphany. I was suddenly brought to mind of a wonderful post I had read a while ago by the fabulous Fearless Formula Feeder, called The Case For Extended Bottle Feeding. 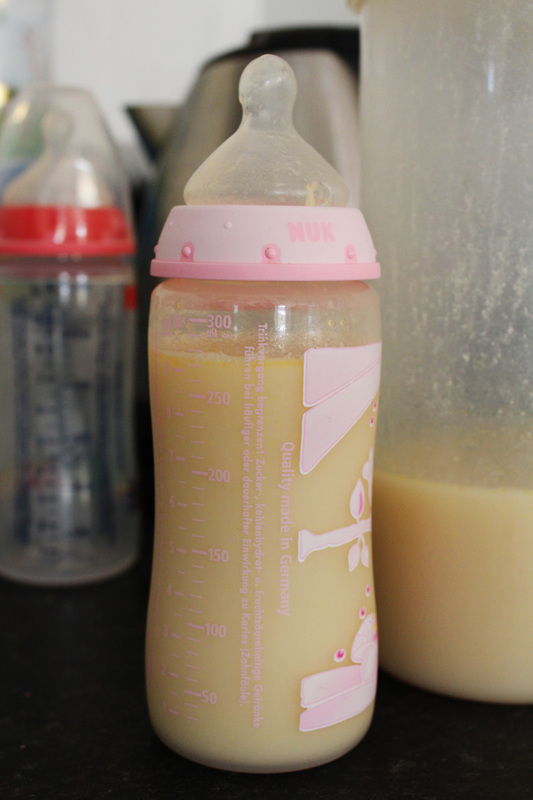 In it she discusses the pressure to get children off the bottle but not the breast, and reading it was the first time I had considered that maybe it was ok to let your child continue bottle feeding (it’s an excellent article, I recommend a read if you’re interested in the idea). Extended breastfeeding is promoted and revered in the natural parenting community not only for its nutritional benefits, but also for the emotional connection and attachment it embodies. I have nothing but admiration and respect for women who breastfeed beyond infancy. If I could have been one of them, I would have done it proudly. I suddenly realised, as I cuddled and fed my baby – how was what I was doing in that moment any different emotionally than breastfeeding? Why should I cut this short as soon as possible, just because it was a bottle she was sucking on rather than my breast? I have been giving Scarlett homemade formula since she was about 8 months old. It is full of wonderful nutritious goodies and I had already decided that I wasn’t going to wean her onto cow’s milk at one year old, as many people do, but rather that I would keep giving her my homemade formula, simply because I feel it is much more nutritious than straight cow’s milk, and she enjoys it, so why not? So my realisation was this – if I were to practice extended breastfeeding, I would continue to nurse my child until she initiated weaning, both because of the nutritional value of breastmilk and the emotional value of breastfeeding. But here I am bottle feeding – and why should it be any different? 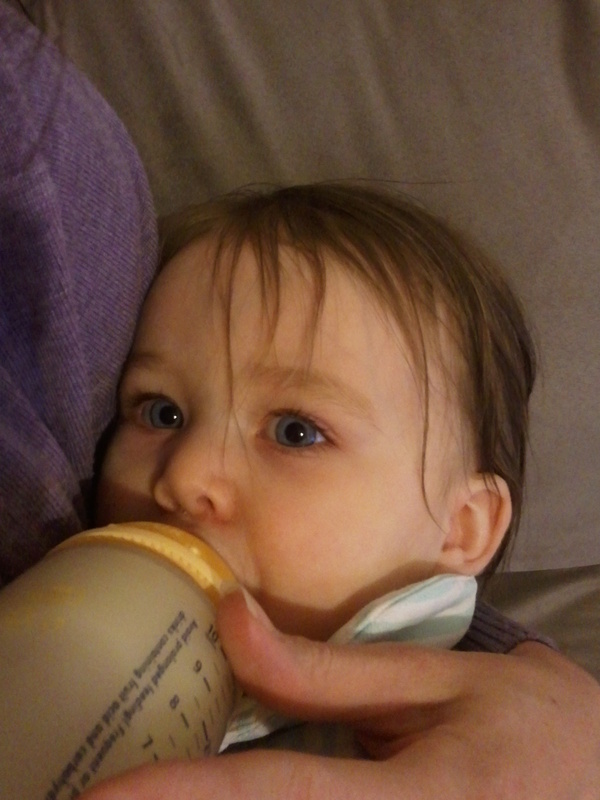 Why shouldn’t I continue to bottle feed her until she initiates weaning – to give her the nutritional value of the homemade milk drink I give her and the emotional benefits of our cuddly feeding moments? I think sometimes mums feel embarrassed if their child drinks from a bottle over a certain age. As if the child is being “babied” and should be being pushed into independence. And yet extended breastfeeding is celebrated. The idea of “pushing” your child into independence goes against everything attachment parenting stands for. If we advocate allowing a child to wean when THEY are ready, why not include ALL feeding in that? Although he is referring to breastfeeding in these statements, I see no reason why they shouldn’t apply to bottle feeding as well. I’ve realised that just as I have fostered an attachment-parenting style of bottle feeding up until now, so also in this way can I continue. I can allow my child to wean naturally when she is ready, regardless of the fact that she gets her milk from a bottle. I highly doubt that she will still be running around with a bottle at 5 years old. My experience so far has been that if I give her what she needs, she will naturally grow past things when she is ready to (and probably much sooner than I would like! :-P). At the end of the day, the most important thing is that we love and nourish our children the best way we possibly can. And I would like to have those little eyes looking up at me for as long as she needs the feel of my chest on her cheek.